Memorial Day Weekend is time usually spent outside enjoying the nice weather. Picnics and Barbeques are common during this holiday weekend, but you don’t want to make your holiday memorable by getting food poisoning. Food poisoning occurs when you eat poorly handled food that can be contaminated with bacteria, viruses, parasites, toxins, or other substances. The symptoms of food poisoning include nausea, fever, vomiting, stomach cramps, and diarrhea. These symptoms can occur hours after eating the contaminated food and can last for serval hours or even days. A good way to make sure you don’t get food poisoning this holiday weekend is by making sure your food was grilled like a P.R.O! Now for cold food you want to make sure you avoid the Danger Zone! The Danger Zone is the temperature range in which bacteria can grow faster, between 40°F and 135°F. To stay clear of the Danger Zone make sure you keep cold food at or below 40◦ F by keeping the food in a refrigerator, in coolers, or on ice. Also, limit the time coolers are open and do not leave the coolers in direct sunlight. 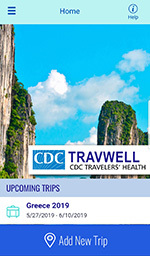 Know before you go—this is what the Centers for Disease Control and Prevention (CDC) is advising travelers this summer. CDC posts health notices for countries that may have alerts for practice and enhanced prevention or may have watch level practice precautions. All this information is available online at http://wwwnc.cdc.gov/travel . It is also available as a mobile app, TravWell, to plan for healthy and safe international travel. It is user friendly and easy to use. The app let’s you store travel documents, keep a record of your medications and immunizations, and set reminders for boosters.